These boxes are evidence of a well loved bunny. Tofu the bunny doesn’t get this royal treatment all the time. Usually he has to share his carrots with the rest of the household. Wow. Tofu eats better than I do some days… hahaha. Too cute. He is well loved indeed! He certainly is a lucky bunny; did you know carrots are actually not good for bunnies? Apparently it’s the sugar content that can cause tooth decay. Our Dustie didn’t even like them much, but she absolutely loved celery and kale! But the vet suggested not to feed her too much kale (only once a week) because it could cause urinary tract problems. Carrots aren’t good for chubby bunnies either. But they do love them. Who would think that what we consider health food is only a treat for bunnies? Hi Genie, they aren’t that good for humans either because they are considered a carb with a high glycemic index. Too cute! 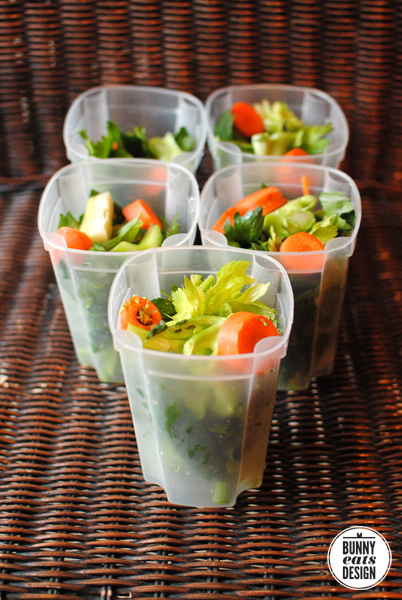 You could start a niche business with these bunny lunch boxes Genie;) Gorgeous pics! I need to post some pics of Flatpac and Archies dinners. I recently bought them some kale and they went absolutely nuts for it. New favs are raspberries and kale! I chuckled when I saw this photo. I do the same thing but for my kids snacks! lol. Tofu is very much the king of the house. Adorable!! How old is he?